Igor I. Tiourlik was born in 1952. His education includes Kazan State musical college (1967-1971), then Kazan State University (Physics and Mathematics Department, 1971-1976); then he worked for five years as a research engineer in the field of hydrodynamics. His involvement with jazz music at about that time was a turning point in his life. He quitted the profession of engineering and returned to music, however, this time not to classical music but to jazz. Jazz music for him had become a powerful language of expression, a way of life and philosophy. 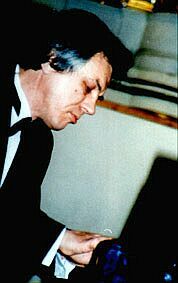 To complete his knowledge of music he attended the Kazan State Conservatory for five years (1981-1986) and together with his jazz group "Formation" took part in the biggest jazz festivals and competitions (including international) in Russia, Byelorussia, Ukraine, Baltic Republics, Georgia and other countries, worked few time as a pianist in the State Chamber jazz orchestra led by Oleg Lundstrem. His education in mathematics had given to him a different mentality and an original ability to interpret music. Consequently, his improvisation technique developed in "mathematical" and romantic style. For many years he taught piano-improvisation classes at the Kazan State musical college, at the Kazan State Conservatory, than at the Saint-Petersburg State Academy of Culture. He performed improvisation and jazz music in Russia and Germany, worked as a pianist in high class hotels in Turkey and Italy. He performed music with Russian and American, Turkish and Polish, Britain and German musicians. Igor Tiourlik. Pr. Kosygina 28 block 1 apt.150, 195298 Saint-Petersburg Russia.